So Friday down on 6th street, I marvelled at the mass amount of culture floating around the bricks and shops. Well, overnight, a nothern storm blew through and dropped the tempature about 20 degrees for the day. The wind also made if feel like back home in Kansas City. The thing is, though, Kansas City was going through their own version with an additional 8 to 10 inches of snow on top. So at least we missed out on that. 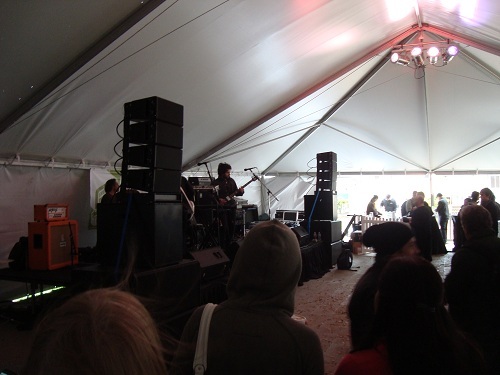 We were guessing that the crowd would thin down to the badge holders for SXSW because of the weather. As the evening came Saturday, there were tons of people out, but nowhere near Friday night’s crowd. That said, the concert going faithful still made the venues respectable. Through the cold, we made our shows and ended the Music portion of SXSW a memorable one. Today, it’s the softball tournament and battery recharge before the one day drive back home.